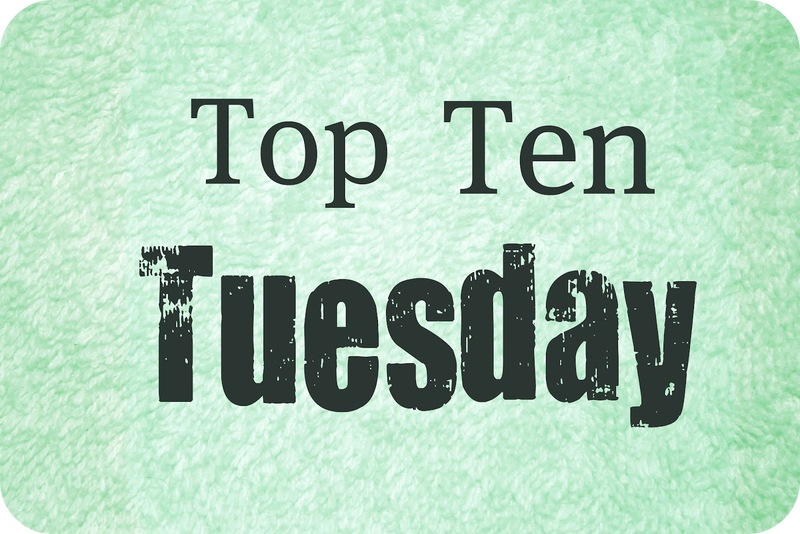 The Broke and the Bookish : Top Ten Tuesday Rewind With Jamie!! For the future TTT schedule, go here! When I first started blogging at the end of June 2010 I wasn't much of a YA reader. Mostly because I thought YA books = only teens should read them. Slowly but surely I learned that this was not true and I've been trying to catch up on all the great YA books out there -- a task that is truly daunting and never ending but AWESOME. Here's a few of the books that have been my favorites (read: I probably recommend and push on people ALL THE TIME) since I've started blogging! I cheated a little bit but that's to be expected, yes? I've loved SO MANY of these books. And I know I wouldn't have heard about them without the blogging community. I'm actually reading The Lost Girl right now and Loving. You all keep talking about that Jessica Darling series, so I'm going to have to check it out sometime. Okay, so I pretty much love everything that I've read from your list so I MUST read the rest of them asap. I'm especially looking forward to The Lost Girl; I've read so, so many good things about it. I feel like I'm having such a book blogger fail moment because I haven't read most of these. *hides* I really need to soon! The Hunger Games would make me list. Wasn't so keen on 2 or 3 but the first was fantastic! Argh! I linked to the wrong post, I linked again to my most current TTT. Sorry about that. Anyway, I appreciate the REWIND opportunity, I got to use your past prompt "Top 10 Books I'd Give A Theme Song To". I'm a fairly new blogger, so I didn't have the chance to use that TTT prompt the first time around. Great post! I am a new book blogger so I haven't read a lot of books, YET. However I'm really looking forward in joining this meme soon! I have only read Hunger Games in your list but I'm checking the rest out. =) I've read a lot of raves for John Green and I'm excited to read Looking for Alaska. I did this topic as well. Anna, Paper Towns and The Sky is Everywhere made my list too. The rest of your list are ones I either read before I was blogging or ones I want to read! Your list is full of my favourite books or books on my tbr! Im glad you love Under The Never Sky- i havent seen much hype about it and i love it! I love so many of these books! My favourite would have to be If I Stay/Where She Went. They were amazing! I haven't read any of these! :( Shame on me. I will definitely check them out, though. Ah, John Green- what a master storyteller; I started reading his novels since blogging, TFiOS being the first and LFA a month or so ago and I am absolutely in love wiht his work. I can't wait to read more! And THG! I adore those books so much, though without blogging I mayn't have ever read them! I have heard really good things about Between Shades of Grey - I know it is going to be on our school book fair, I will have to pick it up. Great list! I loved everything on your list that I have read! I really need to make time for Paper Towns soon because I really loved Looking For Alaska. I read THG because of all the reviews and I'm still glad I read them. They are not the best books ever, but they were good! And between shades of gray is a pretty book. I've read it before I started to blog, but it's very intense. Great list! I love your list! Even though I've only read 'The Hunger Games' trilogy out of all of them (eeek!) I've been wanting to read 'Under the Never Sky' for ever, and after reading your reviews of the rest of these, well let's just say I'm off to add to me 'to-read' pile :) Thanks so much for sharing! New GFC Follower & New TTT participant! Great list! I've only read The Hunger Games, Looking For Alaska, and The Sky Is Everywhere, but I've heard such good things about the rest of the books that I'll get around to reading them eventually. Reading lists like yours makes me realize that there are still so many good books out there, but there's so little time! I've only read a few on your list, but now I'm convinced I have to read more. The Lost Girl was amazing! Just finished reading it, too. My absolute favorite YA will always be the Outsiders, but there are lots of other good ones on your list! Great list! I have read about half of this list, and I want to read all of the others, too. Under the Never Sky was a bit slow for me as well, but I do look forward to Through the Ever Night, especially since you liked it so much. I did the bookish confessions this week since I missed it the last time around. Much fun! Wanderlove is hands down on of my favorite books that I've read since I started blogging! SO GOOD! Great list! love the sky is everywhere. have to check out some of these. Such a great list! :) I've got to read 'Wanderlove'! I haven't read any on your list. I should probably fix that. OK, that's it, I'm reading John Green! I need to read Stephanie Perkins and John Green. Ahhhh! They're going to the top of my list! Must...read...faster! Hunger Games would make my list too. I opted to do my Top Ten Places To Read for this week. I'm in the middle of The Fault in Our Stars and I'm now a John Green fan! I love how his books are really genuine and thought provoking. I finally read Anna and the French Kiss and now I'm in the midst of tracking down Lola and the French Kiss. Okay, this is a great list. I love a lot of them, and i'm adding the ones I haven't read yet to my wish list because it seems like we have similar taste! This list also reminds me that I REALLY need to read Where She Went! Wow. I haven't read... pretty much all of these. But they're on my to-read list! Time to get cracking, I guess. John Green is perfection! Love your picks! Oh John Green...sigh. I love his books. If I Stay had me sobbing like a baby. I loved that book. There are so many books on this list that I want to read! I came late to the party, but hope you will visit my Blast from the Past! My list is 10 series I've started and don't know if I want to continue reading. Great list! So man of these would be on my list too... and a few I apparently need to pick up. Oooh awesome list! I've read a few of those, but I'm definitely interested in checking out more of them if they're in your Top 10 list!! Great list - I might have to check out some of these, since you've included some of my favorites here...thanks for the recs. Really interested in under the never sky!